(January 4, 2003) -- A brazen, midday bankrobber has struck again...hitting the same downtown LB bank a second time, marking the third downtown LB bank he's robbed in less than 30 days. On January 2, LBReport.com posted a security-cam photo (right) of the suspect during one his two December "unauthorized withdrawls." LBPD and the FBI have asked for the public's help in identifying and locating this suspect. 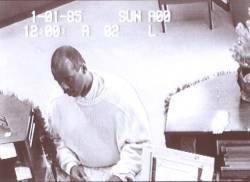 Police say that on January 3, he entered the California Bank & Trust branch at 444 W. Ocean Blvd. at 11:11 a.m., handed a teller a threatening note and left with a substantial amount of cash. Police believe he fled in a black Lincoln Navigator driven south by an as yet unidentified person. On December 12, the same suspect walked into the same California Bank & Trust at 444 W. Ocean Blvd. and demanded money. In all cases, he fled with a significant amount of money. Witnesses have previously described him as an African-American male, balding, 5'8" to 5'10", 190-200 lbs. with a thick mustache.